The Goddess Ostara, Anglo-Saxon Goddess of Spring, the East, Resurrection, and Rebirth, is also the Maiden aspect of the Three-fold Goddess. Ostara was an important Goddess of spring to the ancient Saxons, but we know little else of her other than this. Some have suggested that Ostara is merely an alternate name for Frigg or Freya, but neither of these Goddesses seem to have quite the same fertility function as Ostara does. Frigg, goddess of the home, wouldn't seem to be associated with such an earthy festival and Freya's form of fertility is more based on eroticism than reproduction. However, Ostara is associated, almost interchangebly, with many different goddesses. She is essentially identical to Freya, for she is the goddess of the fertile spring, the resurrection of life after winter. She was equated with the goddess Idunna, who bore the Apples of Eternal Youth to the Aesir, and many believe that Ostara and Idunna are the same, or represent the same principle. She is almost certainly the same as the Greek Goddess Eos, Goddess of the Dawn. (Again, following the threefold theme -- Eos is the Maiden aspect of the three goddesses Eos /Dawn, Hemera /Day and Nyx/Night.) As Ostara is Goddess of the Dawn, we can understand why sunrise services have always been an important aspect of the spring resurrection/rebirth observances of other cultures. Pagan Anglo-Saxons made offerings of colored eggs to her at the Vernal Equinox. They placed them at graves especially, probably as a charm of rebirth. (Egyptians and Greeks were also known to place eggs at gravesites). The Goddess of Fertility was also the Goddess of Grain, so offerings of bread and cakes were also made to her. 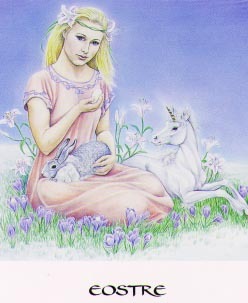 Rabbits are sacred to Ostara, especially white rabbits, and she was said to be able to take the form of a rabbit. One myth says Ostara found a bird dying from the cold. She changed it to a rabbit so it could keep warm. Maybe this is why the Easter Bunny brings eggs to children on Easter. Traditionally German children are told that it is the Easter hare that lays all the Easter eggs.